Click here for more information about this setting. When an application is opened, the Portal Manager will check for missing titles in the various portal languages with this option. Click here for more information. With this setting the title of the connected data field and binding will be shown on the workspace in the application elements. In the Design module, images can be included as a background for groups. With this setting, the images will be shown on the workspace. When elements are moved on the workspace, both the original and the new position of the element will be displayed. The hidden area will be moved to the foreground as soon as a control is moved to the hidden area tab via drag & drop. Controls can also be moved from the hidden area to the workspace by drag & drop. In this case, the workspace will be brought to the foreground. If this behavior is not desired, please deactivate this setting. Displays or hides the ruler on the workspace. If you drag a new element to the workspace or move an existing element, this setting will activate dashed lines which help you to align this element to the others. This setting will show a grid on the workspace. The grid size (the distance between the grid points on the workspace) can be set here. The standard value 5 corresponds to a distance of 5 pixels between individual dots. Defines the number of editing steps that can be reversed via Edit menu / Undo. With this option, you may choose the number of recently opened applications that will be shown in the lower area of the File menu. Defines whether the titles of edit and view elements, which can be created automatically, should be assigned to the left or above the element on the workspace. 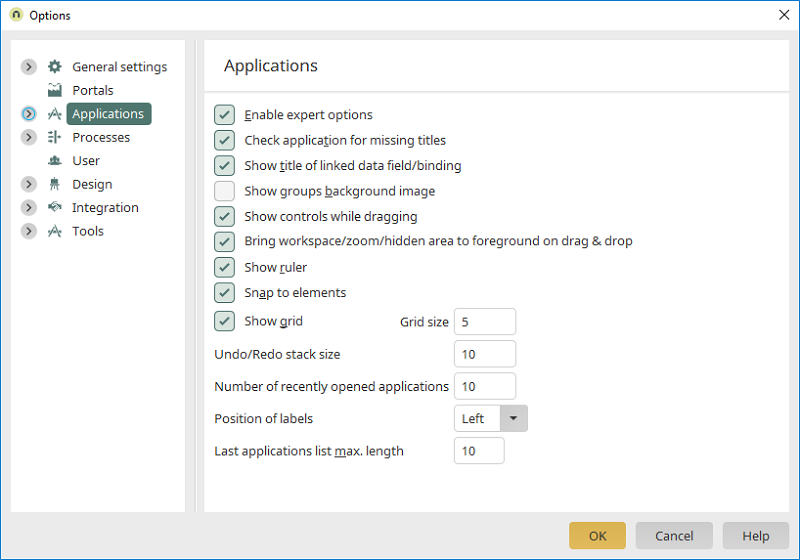 Here, you can specify how many of the most recently edited applications will be displayed in the Application Manager, when "Recently edited" is selected.